Typically, a professional certification process consists of an examination or a formalized assessment of a candidate’s qualifications such as education and experience by an “independent entity” in order to grant the certification in a particular field. In the context of identity theft, some identity protection companies advertise that they employ “certified experts” or “certified advisors” to serve their customers. However, these companies fail to specify what professional certification their employees hold and which organization granted the certification. For the most part, when these companies refer to certification without specifying the certification name and issuing body, they most likely refer to their “internal certification” process which is not independent. Internal certification often refers to a company’s training program which is based on its operating procedures for various groups and roles. For example, the resolution center or call center employees may be trained on company procedures related to customer call handling and documentation, internal or external reporting such as Legal or law enforcement, and engagement of management or other groups within the company. After employees complete the training course, they are often required to take a test to prove their knowledge of the training materials and company’s operating protocols. These training and tests are managed by internal company staff or their consultants. 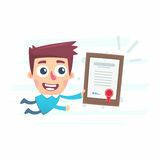 On the other hand, professional certification issued by an independent body such as Identity Management Institute is not based on a particular company procedures but it is rather based on a formal curriculum which may have been developed using best practices, formalized exams, and qualification standards by the independent body. A professional certification issued by an independent body has much more weight than internal certification issued by a company’s management to their employees. First an independent external certification is not biased where the program is designed to meet a specific company requirements and is often a requirement for hiring a candidate. whereas a company may still employ workers even if they failed the internal certification test because they are already hired. Second, the internal certification occurs after the employee is hired whereas an external certification such as the Certified Identity Protection Advisor (CIPA) may be required before the employee is hired. And third, an independent certification is embraced by many global organizations. These are the main differences between internal and external certification; the main difference being the independence.